I know most of this site’s readers on this site would spend their last dime on bullets and powder. But sometimes, you do have to purchase other essentials such as winter clothing and outdoor gear. Plus it’s the holiday season again, and that means gifts for the family. Today we’re featuring Sierra Trading Post. This is a solid company that provides a wide variety of products for the outdoorsman, at sometimes spectacular prices. This editor has personally shopped with Sierra Trading Post for years, and just today I purchased two items, a Windstopper® Base Layer Shirt (item 12991) for winter motorcycling, and a set of Kenyon Polarskins polypro long johns (item 13854) for snow sports. At $16.95, the Polarskins are half the price I’d pay for a similar product from most outlets. I’ve got one of these LED lamps. 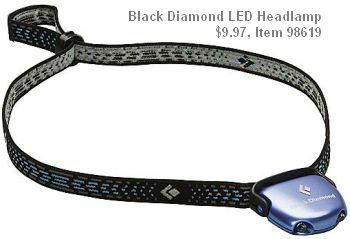 It is much lighter than most other “headband lamps” and the battery lasts a long time. I use it for camping, reading, and even in the reloading room in the evening for extra illumination. For $39.95, this Blaze Orange/Khaki Winchester Upland hunting jacket is a great bargain, though it’s not waterproof. What I really like is that it comes with TWO fleece inner liners–a vest and a full-sleeved inner jacket, both of which can be worn separately. It even has cartridge holders in the front and a game pouch on the back. Here’s what one purchaser has to say: “Have worn this in thick bushland, stands up to abuse, and with blaze orange built in, no need for extra items of [hunting] clothing. Very adaptable with warm vest that can be removed if too warm”. 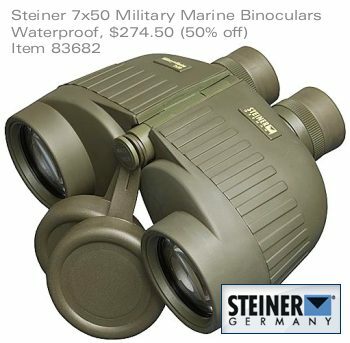 If you want a pair of armored binoculars that will last a lifetime, these 7×50 Waterproof Steiners are a great deal at $274.50. Even at “ultra-discount” warehouse stores, 7×50 Marine Steiners sell for $300-320.00. These binoculars are based on the rugged Steiner mil-spec 7×50 unit used by the U.S. Army. Steiner’s fully-coated lenses are legendary for their clarity and resolution. Sierra Trading Post isn’t all just camping and outdoor gear. There is a wide selection of other suitable gift items for the wife, kids, and relatives — wool sweaters, silk underwear, travel accessories, ski goggles… you name it. Kevlar Vest vs. 24 Layers of Drywall — Which Stops Bullets Better? 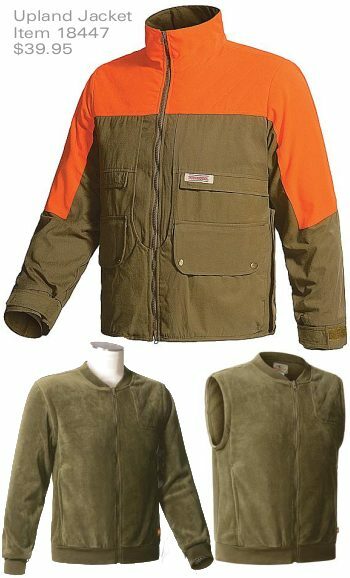 Share the post "Bargain Days at Sierra Trading Post"
I would like to know where I can purchase the “Winchester Upland hunting jacket” Item 18447 – $39.99??? If anyone can help please E-Mail me at brc_whitehead@yahoo.com Thank You for your time, Bruce W.
I have the black diamond head lamp, i use it for fishing its great.